Cambridge Academy of Martial Arts was founded in 1989, by Ollie Batts and his assistant instructors and senior students at the time. The Academy is a non-traditional organisation offering a range of complementary fighting art disciplines. These include: Filipino Martial Arts (Kali/Eskrima/Arnis), Jun Fan Martial Arts & JKD Concepts, French Savate (both sport and street), and Russian Cambo / Sambo & Combat Sombo&REG;. We call this mix: 'Integrated Fighting Arts' or, more simply, 'CAMA Multicombat'. 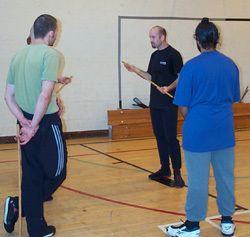 CAMA is one of only a few groups in the UK to offer regular French Cane (Canne de Combat) training sessions. Ollie demonstrating frontal reverse kick in Savate kickboxing with apprentice instructor Tim Campbell. Ollie Batts has over 30 years experience in the martial arts, and now holds several instructor grades. These include: fourth degree black belt in Combat Sombo&REG; (UK Sport recognised), third degree black belt in Doce Pares Eskrima, under Grandmaster Danny Guba, second level instructor in Jun Fan JKD/Kali, under both Rick Young (Edinburgh, UK) and Rick Faye (Minnesota Kali Group, USA), and he is also a Professor in the art of Savate, under the Great Britain Savate Federation (GBSF). Prior to 1989, Ollie taught traditional Korean martial arts for many years in Cambridge, holding black belts in Taekwondo, Hapkido, and Kuk Sool (one of the UK's top instructors in 1989). 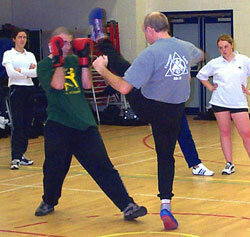 Julie demonstrating a defence against coup de pied bas in Savate kickboxing, with assistant instructor Gareth Tucker. Julie Gabriel has over 20 years experience in martial arts, training mainly with Ollie. She holds a third degree black belt in Combat Sombo, second degree black belt in Doce Pares Eskrima, under Grandmaster Danny Guba, first degree black belt in traditional Korean martial arts, and has been awarded instructor grade in Kali and Jun Fan / JKD under Rick Faye (Minnesota Kali Group, USA). She is a Professor in Savate under the Great Britain Savate Federation (GBSF). Julie was a member of the Great Britain team in the 2005 & 2007 European and the 2006 World Savate Assaut Championships, and is the current GB league champion in the 52-56kg category. She was placed 5th in the European Canne de Combat Championships in Strasbourg in 2006. She teaches regular Savate, Canne de Combat and Kali classes, as well as private sessions, and self-defence and related topics in schools, colleges and companies. Tarquin Coles joined the Academy in 1997, after previously studying Karate for six years and having achieved his black belt in that discipline. He was the first member of the Academy to win a Sombo Wrestling black belt, when he became British Champion in the 90kg weight class in Bedford in 1998. Tarquin was awarded his CAMA Level I Grappling instructorship in July 2003. Morgan Alexander joined the Academy in 1999, and was awarded her JKD/Kali instructor qualification in September 2006. In December 2006, Morgan was also awarded her brown belt in Doce Pares Eskrima, by Grandmaster Danny Guba. She competed in the World Canne de Combat Championships (La Réunion) in October 2004 and the European Canne de Combat Championships (Strasbourg) in 2006. Morgan was a member of the Great Britain team in the 2006 World Savate Championships and the 2007 European Savate Championships, and is the current GB league champion in the 65-70kg category. Morgan teaches our regular Canne de Combat classes. Gareth Tucker joined the Academy in 2000 and as well as gaining his JKD/Kali instructor certification with us, has since gone on to complete a degree in Sports Science. Early in 2007 Gareth was also awarded his brown belt in Doce Pares Eskrima, by Grandmaster Danny Guba. Jon explaining the finer points! Jon West returned from a round-the-world odyssey in 2003. He has trained with the Academy for 6 years, mainly in Savate, Cane and Kali. He holds initiateur level in Savate, and also teaches Canne de Combat. 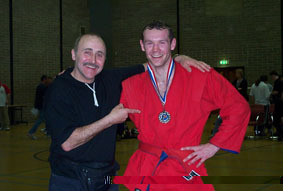 Jon competed in the Championnat du Monde de Canne de Combat held in La Réunion in October 2004, and was also the main instructor for the Great Britain team. In addition to Instructor training offered through national associations and federations, such as the Great Britain Savate Federation (GBSF), the Academy runs an in-house instructor training programme. Apprentice and Assistant Instructors provide assistance to beginner level students on basic training drills, and may lead sections of a class or work with small groups of students under the supervision of the main class instructor. CAMA instructors, who are responsible for running any training sessions, are required to hold a basic First Aid certificate and be regularly CRB checked. Mike Tabrett began training with us in 1998, and is now a Assistant instructor (JKD/Kali). Mike is also a fully qualified Tai Chi & Chi Kung instructor. Tim Webb joined the Academy in August 2002 and was awarded Assistant instructor (JKD/Kali) in September 2006. Tim Moore was awarded his first Degree Black Belt in the Doce Pares Eskrima system, by Grandmaster Danny Guba, in 2006. 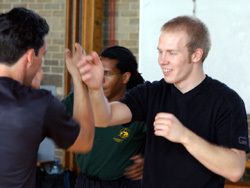 Chris Hill is a Savate Initiateur instructor and a qualified Kickboxing coach. Fara Afifi is a qualified massage therapist and Tai Chi instructor; she has trained with us since 2003.